Small changes offer big benefits when it comes to selecting aftermarket rods for your next Chevy LS engine build. Here’s a look at how rod length affects the performance and durability of an engine - and you thought you’d never use that Geometry you learned in high school! 27 thousandths of an inch doesn’t sound like much. It’s about the thickness of a multi-layer steel head gasket typical for 4 cylinder applications. It’s almost exactly half as thick as a dime, which mics out at 0.053 inches. It’s a bit smaller than you might gap your plugs on an old-school points ignition small block Chevy. But like everything involved in high performance engine building, tiny fractions of an inch make significant differences in horsepower and durability, and that’s why rods that are ever so slightly longer than “factory stock” have become a big deal in LS engine builds. .027in isn't much but it makes a big difference inside an engine. To get some insight into rod length selection for GM’s LS platform, we consulted with K1 Technologies’ Nick Diblasi, our go-to source for anything involving engine internal components. He began by giving us an education the common center-to-center rod dimensions for small-block Chevy engines, both vintage and modern. Unlike most other V8 engine designs, including the previous generations of the small-block Chevy which use a piston with a pin location that is very slightly offset from the centerline of the bore toward the ‘thrust’ side in order to reduce piston rocking (often referred to as ‘slap’), the LS family has factory pistons with wrist pin bores that are centered. That meant that straight off-the-shelf SBC designs wouldn’t work properly with pistons designed for the LS. “The first iterations that made the rounds were offset, since they were using traditional SBC 350 and 400 rods and the LS pistons had to be made to accommodate the .060" rod offset,” Diblasi explains. “Over time, rod manufacturers saw the high demand of the LS platform and made centered 6.125 rods, and various other lengths ranging from 6.098 to over 6.700 for use with tall decks. A longer rod will require a piston with a shorter compression height in order to keep the deck clearance the same. Switching to a longer 6.125 rod will require a piston with a compression height that is .027-inches less than a stock slug(assuming the crank remains the same), but moving the pin bore up by that amount isn’t a problem. “The sweet spot that everyone tries to achieve is 1.8 rod ratio,” Diblasi continues. “A factory 5.3, 6.0, or 6.2L LS/LT-based engine has a rod ratio of 1.684. That is pretty impressive for a pushrod V8, as the standard small block 350 was about 1.676.” While 1.8 is the theoretical ideal, in the real world other factors may make a longer rod physically impractical or require tradeoffs in terms of engine power dynamics. In addition to length, LS engines came factory with a .945in piston pins. 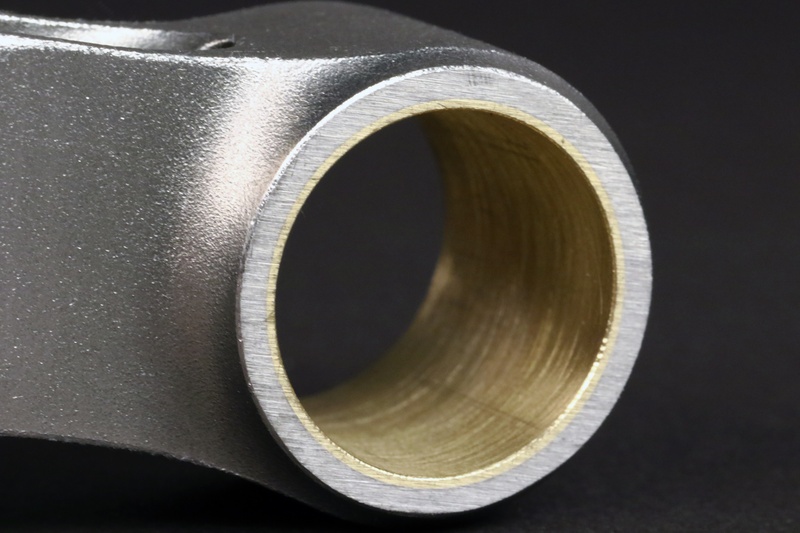 K1 offers 6.098in connecting rods in the .945in and more common .927in pin bore sizes. 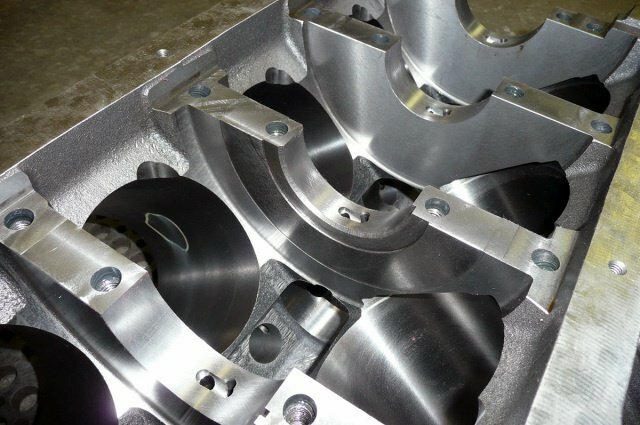 In order to understand these advantages and disadvantages, you have to first understand what’s happening inside the engine as the rotating assembly moves through its cycle. By visualizing the geometric relationship between the crank journal and the wrist pin, you can see that an engine with longer rods will spend more time (in terms of both actual milliseconds and degrees of crankshaft rotation) with the piston relatively motionless at both the top and the bottom of the stroke. It will also have less leverage against the sides of the bore at mid-stroke. 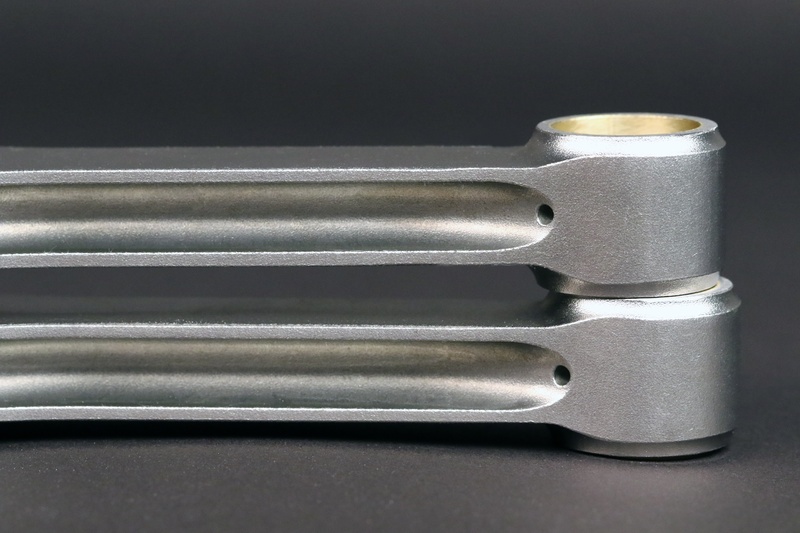 Because the cylinder bore sleeves in stock LS blocks are somewhat short on the bottom end, stroking an LS engine can lead to unusual wear at the bottom of the bore due to the pistons being partially unsupported at the bottom of the stroke. Aftermarket blocks such as this DART LS Next, typically have slightly longer sleeves to avoid this issue, but for many builders on a budget, the accelerated wear on a stock block is an acceptable sacrifice in exchange for the low price of a junkyard block. With the benefits of a longer rod in mind, what are the potential pitfalls? For one thing, longer rods will require pistons with a shorter compression height (the distance between the center of the pin bore and the top of the piston) in order to avoid potential interference issues and maintain combustion chamber volume at TDC. Diblasi explains, “When changing rod lengths, shorter or longer, the piston needs to be adjusted to compensate for the changes. The total package of deck height, stroke, rod length, and piston height all are a function of one another. 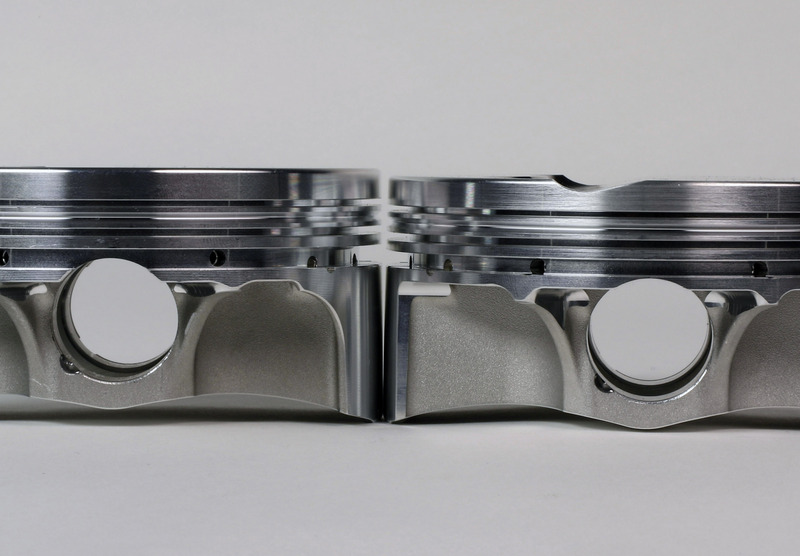 Since the deck height, stroke, and rod are typically fixed when designing a piston, the piston has to be the variable component to make it all work. When an engine builder decides to use a longer rod, the compression height needs to be reduced by that exact amount in order to maintain the same total deck clearance. For instance, if you are going from a stock 6.098-inch LS rod to a 6.125-inch rod, you will need to order a piston that is .027" shorter. These are readily available from Wiseco. In some cases, the desire for a better rod ratio can involve tradeoffs like moving the pin bore up high enough to actually intrude on the oil ring groove in order to get the right compression height. Fortunately, with a support rail for the oil ring, pistons like this have proven to be reliable and durable. In the case of stroker LS builds, special consideration has to be given to another quirk of factory blocks beyond maintaining a good rod ratio. “One of the bigger issues with LS engines is the relatively short factory cylinder bores,” Diblasi explains. “When stroking any LS-based engine, the pistons typically start to pull out of the bottom of the cylinder, and as the piston changes direction it applies force on the skirt. It starts to create a line at the bottom of the piston where it starts to wear. Aftermarket and LSX blocks have longer sleeve lengths to combat this issue, but the majority of consumers are taking OEM 5.3L, 6.0L, and 6.2L blocks and putting 4.000" cranks in them.” Other than retrofitting a factory block with longer sleeves or switching to an aftermarket block, there’s really no solution to this issue, but for many LS builders, the bargain basement price of OEM blocks is worth the tradeoff. 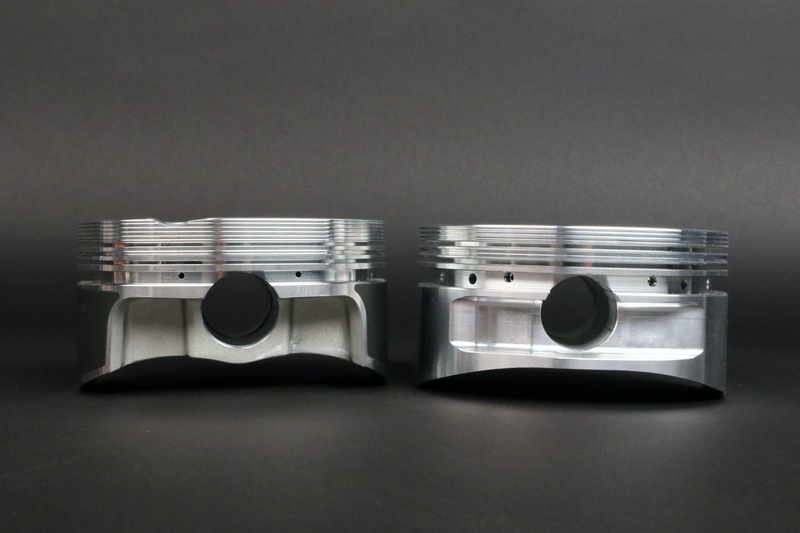 This small-block Chevy piston (right) has an offset pin, while the LS piston (left) has a pin centered between the skirts.